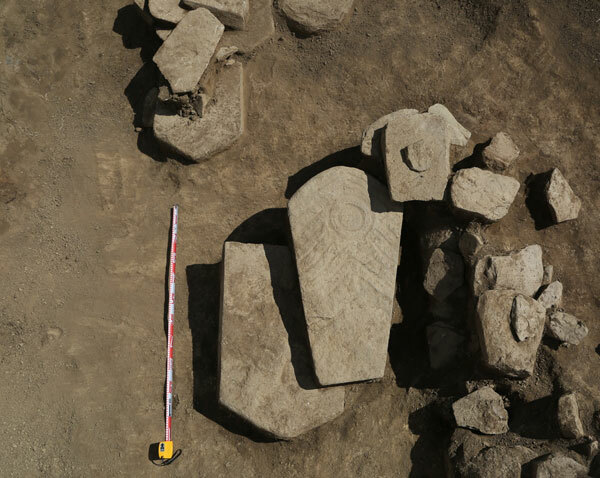 Archaeologists have excavated a set of stone shields in Northwest China's Xinjiang Uygur autonomous region which they believe were used in sacrifices by nomads nearly 3,000 years ago. The shields were discovered by Huahaizi (sea of flowers) Lake in the Altai mountains, which borders Mongolia. The lake shore meadow is home to huge stone relics, including what archaeologists believe to be the largest temple of sun on the Eurasian steppe. The area is strewn with numerous deer stones. The shields are pentagonal stones, one with a circle carved in the center, surrounded by a herringbone pattern. "Initial researches show the shields could date back to the late Bronze Age, roughly 3,000 years ago," said Lyu Enguo, researcher with Xinjiang's archaeological institute. Lyu describes the discovery as a "breakthrough" for research on the life of ancient nomads. Experts from the Chinese Academy of Social Sciences, and the cultural relic bureaus of Altay Prefecture and Qinghe County started the excavation in July to find ways of better protecting the relics. Badly affected by earthquake and climate change, the stone complex has been eroded by the lake water, and will be further damaged if protective measures are not taken as soon as possible. Archaeologists have compared the patterns carved on the shield with those on deer stones. Pentagons and herringbone are on many deer stones found on the Eurasian steppe. Deer stones are ancient megaliths carved with symbols that can be found all over the world, but are largely concentrated in Siberia and Mongolia. The name comes from their carved depictions of flying deer. There are many theories behind their existence and the people who made them, but expert opinion remains divided. The patterns at the current site are especially similar to those on deer stones from Mongolia's Khovsgol Province, roughly 2,000 km away to the east, said Lyu. Experts believe the stone shields were not used for combat, but for sacrifices after they were blessed and dedicated. "They are most likely to be ritual objects for high-level sacrifices, to drive out evil spirits," said Guo Wu, associate researcher with the Chinese Academy of Social Sciences. Modern Shaman often wear small shields as ritual objects. The discovery of these shields may show that such practices date date back to at least 1,000 years ago, said Guo. Between the late Bronze Age and the early Iron Age, residents on the steppe switched a society based on livestock - mobile pastoralism - to nomadic. Nomadic culture was prosperous at the time in the Altai Mountains. "The stone complex which experts believe to be ritual sites for ancient nomads, provides important material for research on social and economic evolution in the Eurasian steppe," said Guo. "It also offers us a rare look at ancient nomads' spiritual world, which mainly focused on Shamanism," Guo added. Archaeologists have also excavated an exquisitely well-preserved deer stone carved with deer head, with a dagger at the center, an arrow quiver on the left and a battleaxe on the right. Recent researches by Lin Meicun, professor with Peking University, showed that the site is most likely to be left by Arimaspi, who occupied the Sayan and Altai region since the eighth century BC.